ESP (ENVOY SoftPhone) | VEXIS Systems, Inc. The VEXIS ENVOY® SoftPhone - ESP for agents everywhere! The user interface of ESP is informative yet uncomplicated. All the call control buttons are grouped together on a tool bar. All controls are in plain sight and intuitive; the concept of “least number of clicks” was a big part of every design consideration as well. One location dedicated to “Session Information” gives the user a view of the current call state, agent state, and all important timers. A single location is used to set the agent mode as well as AUX codes. AUX code, agent mode, and logout codes can all be centrally configured to have custom labels on per agent or agent group level. Speed dial lists (personal, group, and global) can be centrally managed and are shown when the agent needs to dial to allow one click access to numbers in order to save keystrokes. An optional IVR reinsertion list is available to make more efficient use of agent time and lower the average talk time which equates to real dollar savings. Not to mention the fact that you can make your agent desktops reflect the corporate image you would like because ESP can load any number of “out of the box” skins and can even load custom skins designed by your company. 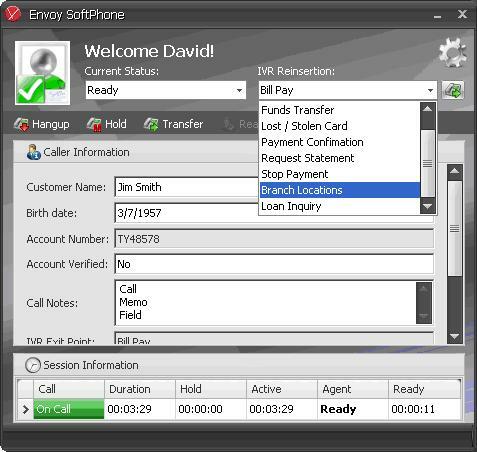 In addition to ESP having great data integration / aggregation capabilities through Envoy® Server, the display of call data (data associated with a call as it progresses through the enterprise) on the ESP user interface is very flexible because the display is dynamically generated. This is a key advantage ESP has over many competitors because this capability keeps the agents efficient and informed and at the same time keeps money in your company’s bank account – a “true” win-win! Anytime a business (or regulatory) requirement comes along where the agent needs a new piece of data – there is a tough decision to be made – either train all of the agent on how to look up that new piece of data or else pay your CTI vendor to modify the SoftPhone to display the new data; both options are time consuming and expensive. ESP can immediately show the new data after a single database update! No SoftPhone code modifications required! No training on a new system to find the new data! The new piece of data shows up in the same application (ESP) that the agents are already using to take calls and assist customers - it just does not get any better or easier. The dynamic data field display of ESP can not only add new data fields, it can re-order them as well through the use of a field priority setting. A “really cool” (and from what we can tell very unique) feature of ESP is “Data Type Aware” data fields. The field that displays on the user interface of ESP “understands” the data type it represents and an inline, context specific field editor accommodates the user by “popping up” when the field is entered.